T1 RECLINABLE RED PVC LEATHER RACING SEAT/SEATS+SLIDERS+4PT BLACK HARNESS BELT. Type-1 PVC Leather Fully Reclinable Racing Seats : Every tuned car focuses on performance or suspension, but if you are going to race, what good are those mods if you have no control over them? You will be constantly sliding on your factory seats at the corners, or leaning in the opposite direction of the way you're turning. It is time to get a pair of racing seats. With higher leg and upper body supports you'll be comfortably seated in the perfect position at all times and in all situations with reduces of the risk from misjudging distance and losing control. Racing seats are easy to install with the correct brackets (not included) and still offer the reliability of stock seats. These seats are also made for using with 4 or 5 point racing seat belt harnesses. Racing Harness Seat Belts : This product provides an extra level of safety beyond that of any OEM 3-point harnesses. By providing the extra point(s), this unit also provides additional support when performing any kind of sport driving or competition. Sabelt buckle and nylon belts optimize the quality of this unit. 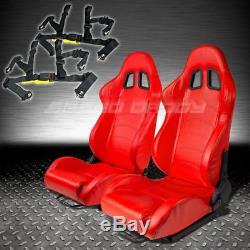 Type-1 PVC Leather Fully Reclinable Racing Seats. Made of High Quality PVC Leather Clothes. High Performance Fully Reclinable Type-1 Racing Style. Recommended for 4, 5 or 6-Point Seat Belt Harnesses. Deep Thigh Bolsters to Keep the Driver Firmly Placed in Seat. Strong, Durable Steel Frame Covered with Comfortable Injection-Molded Foam and Woven Upholstery. Support for Shoulder and Lower Back. Includes Universal Sliders (Seat Bracket is Not Included). Professional Installation is Highly Recommended (No Instruction Included) Racing Harness Seat Belts. 4-Point Racing Seat Belts designed for safety and comfort. High grade 2 width nylon belts with waist protection. Steel Adjusters and Mounting Brackets. Protective Grip on Outer Lining Strong, Durable Steel. Recommended to use with Harness Bar or Roll Cage. 1 Pair Type-1 Style Racing Seats (R+L). 1 Pair of Universal Sliders (R+L). 1 X 4-Point Racing Harness Seat Belts. Racing seats are universal for all vehicles; however, each seat will need to latch to a seat bracket, which is car specific. Make sure there is a bracket available for your vehicle before purchasing. Minor modifications may be needed for some of our products or for certain car models. All items do not come with installation instruction unless otherwise specified. The item "T1 RECLINABLE RED PVC LEATHER RACING SEAT/SEATS+SLIDERS+4PT BLACK HARNESS BELT" is in sale since Thursday, May 30, 2013. This item is in the category "eBay Motors\Parts & Accessories\Car & Truck Parts\Interior\Seats". The seller is "speed_daddy" and is located in Rowland Heights, California. This item can be shipped worldwide.